Amateur comments (?) of christopher jones in his hand reading website. Re: Amateur comments (?) of christopher jones in his hand reading website. The word 'wisdom' is irrespective of any particular religion and culture. By pronounciating the word 'wisdom', you cannot find any particular religious identification there. But, you are just searching for the explanation of word 'wisdom' from various religious aspects. Indeed, Such task is nothing more than futile and It can only frustrate you as you experienced it in your last post. your confusion and helpless situations are happening due to looking for various religious definition of "wisdom"
Swami. vivekanantha, talked about the "common center for the all varying religious ideas , multi-various mythologies etc" at world parliament of religion, chicaco, 1891.
" All this little variations are necessary for the purpose of adaptation''. But, i'm really sorry martijn. Swami.vivekananda talks about common centre for the widely varying radii converge. But, you could focus only the divergence of religion by searching the explanation of each individual religion. It represents only the short mind. By the way, A dictionary meaning will be far better than your Wikepedia link. p.s:- Wisdom is a philosophical subject. The purpose of philosophy is just to explore the hidden truths. During exploration, you may lost the tract helplessly yet, the exploring travels towards truth is inevitable. but, closed minds can only circle around what they theoretically learned. Indeed, they fear to explore new ideas as they feel secure in their conventional theories. Person who know the path, enjoys the trip. but, person who does not know the path, can only frustrate even if he is surrounded by the beauty of nature. stalin.v wrote: Wisdom is absolute. but, science require constant correction century after century. we see the wisdom from the indian culture and their canonical scripts. stalin.v wrote: The word 'wisdom' is irrespective of any particular religion and culture. Isn't it a contradiction of what you said before? stalin.v wrote: closed minds can only circle around what they theoretically learned. Indeed, they fear to explore new ideas as they feel secure in their conventional theories. Do you see a reflection of this in some of your own arguments on this thread? Let the christopher be a researcher on palmistry and it's history. Really he may dedicated lot. But, NOt enough. Because, his sources are belonged to translation of indian and other manuscripts. But, Not exactly like the direct inspection of cheiro, who had come to india and researched it in detail. I am going Cheiro is a subject for another discussion! Let be free from prejuidiced idea lynn. sorry if I misunderstood, I thought canonical meant religious. Yes I agree that Cheiro's room shows his interest in Indian culture. Dont you think, your own statement are self-contradicting above? cheiro has given the references, under the chapter life line, in his book named "language of the hand" , how he follow the indian palmistry and exclaims how accurate indian palmistry is! especially when he talk about influence lines under the chapter "life line". The french palmists, you mentioned, namely D'Arpentigny and Desbarrole has never written anything about palm lines. But, Their works were translated by e.f.allen , under the title 'The science of the hand'. I have given the evidence that claim that how cheiro followed indian palmistry?' but, so far you and christopher have not at all given your evidences for your claims but , blindly says that indians followed western victorian palmistry . doesn't it seem like baseless arguements of you and christopher? Indian astro-palmist are using the hand signature and finger types in order to know one's astrological constellation. I was witnessed in india by a traditional palmistry. So, the idea of french palmists and the origin of their works are doubtful unless we get the proper evidences. Indeed, Those palmists are belongs to early 19th century. But, we know the history of palmistry and it's origin. models as it has been practiced by indian astro-palmists many centuries back. 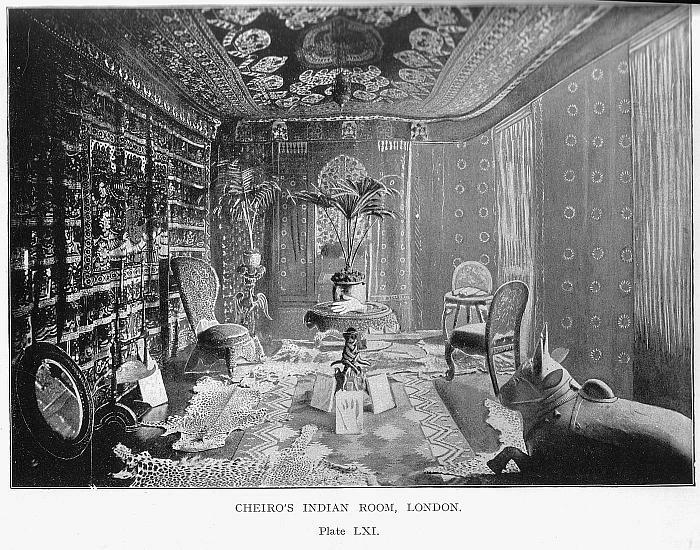 Lynn wrote: Yes I agree that Cheiro's room shows his interest in Indian culture. stalin.v wrote: Dont you think, your own statement are self-contradicting above? I'm sorry I was partly joking with you But it is true that Cheiro was very influenced by the French palmists. D'Arpentigy didn't write about the lines but Desbarolles did. It was D'Arpentigny's book "La Chirognomie' that was translated by Edward Heron-Allen as 'The Science of the Hand'. I have given the evidence that claim that how cheiro followed indian palmistry?' but, so far you and christopher have not at all given your evidences for your claims but , blindly says that indians followed western victorian palmistry . doesn't it seem like baseless arguements of you and christopher? Indian astro-palmist are using the hand signature and finger types in order to know one's astrological constellation. I was witnessed in india by a traditional palmistry. So, the idea of french palmists and the origin of their works are doubtful unless we get the proper evidences. The 'evidences' are in the content of the books, their palmistry interpretations. It is not 'baseless' arguments, it is there for anyone to read these books and judge for themselves. It is well known that D'Arpentigny was the first to make a system of classification of hand shape. (at least in Europe. Are you aware of any system of handshape classification written prior to his book?). Before D'Arpentigny, most palmistry was based on 'chiromancy' - interpretation of the lines, rather than 'chirognomy' - assessment based on the shapes of the hand and fingers. I dont know lynn why you are being stubborn even after i gave the references of cheiro's own statement from his book. but, you have not quoted any of cheiro's statement in order to validate your claim. dont you feel it? I already gave hand shapes as one example. I too have claimed that the works of french palmists were copied from indian palmistry as it has been practiced by Vedic astro-palmists milleneum of years. Hence, frence palmists followed by cheiro and benham are by-product of india. I have proved already that how the own statement of cheiro validates the claim that he is one of the descendant of indian palmistry. Same claim is applicable to benham. Because, cheiro is a senior of benham. Hence, Without the references of cheiro's work, benham might not formulate his own idea. It is the common view of any historian. In additional, Benham have mentioned about astrological sign on palm. It again proves that benham was another descendant of indian palmistry. His method of reading heart line too resembles the classic indian palmistry. You can read Edward Heron-Allen's translation of D'Arpentigny here. If you compare D'Arpentigny's chapter about the thumb (starts page 138) with Cheiro's chapter on the thumb in "Language of the Hand", you might notice D'Arpentigny's influence in Cheiro's work. Also (just from looking at the index on page 24-25) you can see the hand shape classification that Cheiro also uses. You will notice that Cheiro quotes D'Arpentigny in his chapter on the thumb in "Language of the Hand". "It is D'Arpentigny who has said "The thumb individualises the man" This is remarkably true, particularly when one follows out Sir Charles Bell's discovery that in the hand of the chimpanzee, which is the nearest approach to the human, though well formed in every way, yet the thumb, if measured, does not reach the base of the first finger." 2. or before 1640 AC, before J. Belot's "Les Oeuvres" were printed. With number 1. we have probably the oldest European chiromancy book that uses planets in the mounts. With number 2. we have the oldest European chiromancy book that uses the Zodiac for the finger palanxes that copy or use all important European and Indian palmistry books after it, for example: Desbarolles, Chawdhri. - Though I have to add here that I don't agree or work with this assignment. You can inspect the 2000 year old tamil palm leaf manuscripts from this website. Dont bother we have more older than this. your links are not enough to prove the claim of christopher. Any author can make reference from his senior. But, I have already mentioned that how the cheiro had been devoted to hindu's palmistry and it's culture as it was illustrated in his book. so, your arguements are negligible. stalin I am sorry for wasting my time & yours (& everyone else's) on my negligible arguments. If you think that you have found a 'line' which proofs your point... please always strive for efficient communication!! For example, presenting a QUOTE is usually very usefull for your discussion partner(s)! Instead, posting 'arguments' with links to books and/or websites without any specified page and/or paragraph... will usually add not much to the quality of the discussion - and it can even damage/frustrate the process of a discussion! I hope that this makes sense in the perspective of this 'chaotic' discussion - for I have noticed quite a few examples of 'inefficient' communication of arguments. So, please do not disqualify yourself... with lazy 'amateuristic' use of unfounded and/or unspecified arguments/claims/statements, etc. Finally, I also would like to thank you all for the efforts in this discussion!!! argh I see you brought in the military to enforce some order! I guess by your msg Martijn that I am one of the people guilty of 'inefficient' communication. sorry. If you tell me where I went wrong, I can add quotes/references. Cheiro of west somehow interested on hindu culture and it has been demonstrated by the illustrated picture of his book. "Yes I agree that Cheiro's room shows his interest in Indian culture." Here is the illustration of Cheiro's room that stalin and I both like (from some, but not all, editions of "Language of the Hand"). my question wasn't about any palmistry manuscripts but about that with planets in the hand and fingers. Here again, I haven't seen older than the early European. Here you haven't bing in Indian examples until now. - Astropalmistry or the combination of chiromancy and astrology was common by the early European Renaissance chirologists. Your arguments are still negligible. Because, Cheiro, Being an author of palmistry books, can give references from various authors. But, you could hardly give single references from his work so far and claim that cheiro followed the french palmistry. But, The own statement of the cheiro in the same book, "Language of the hand" represents that how much deeply he was influenced by indian palmistry and practiced those knowledge through out his life.
" As mentioned in his memoirs, Cheiro acquired his expertise in India. As a teenager, he traveled to the bombay port of apollo bunder. There, he met his Guru (master), an Indian Bramin, who took him to his village in the valley of the konkan region of Maharashtra. After studying thoroughly for two years. He returned to london and started his career as a palmist". Lynn, Hope you will be recovered from your ignorance soon. p.s: manfred, Let we discuss it in new thread if you wish. Thank you Stalin. It would be only very nice to have a translation or picture if there are any earlier assignments in India. Thanks for adding your quote!! PS. You better ALWAYS add the page/paragraph; if you expect that this might actually create a problem (when multiple prints are available), then you can at least name the 'Chapter' where you have taken the quote!! But in general, you better also ALWAYS mention the page where you found YOUR quote - otherwise your quote will formally become 'incomplete'! !